ConnectSport is working with the Sport for Development Coalition to create a monthly 'call for articles' around a particular theme or subject area. Throughout October 2018 we have been publishing articles which focus on empowering women and girls, and in this article Julia Farman – Equality and Inclusion Lead for Cricket Without Boundaries – talks about gender equality in the context of the charity's programmes in Africa and the UK. One of the recognised key components in stopping the spread of HIV is the promotion of gender equality within a community. At Cricket Without Boundaries (CWB), the charity has over a decade of delivering HIV awareness projects in sub-Saharan Africa, and part of its work is breaking down gender stigmas by facilitating fun cricket sessions that allow the girls within the communities they work with to have the opportunity to play the alongside the boys as equals. Following CWB’s work with the Kenyan Maasai Cricket Warriors, who use cricket to raise awareness of how dangerous Female Genital Cutting (FGC) is for girls and the overall negative effects it has on their community in Laikipia County, CWB was approached by the Lancashire Cricket Foundation for a similar programme to be run in Manchester, where gender inequality and violence against women and girls was on the rise, with the fear that some girls maybe at risk of FGC. What followed was the development of the ‘Let’s Be Women’ (LBW) programme, using the experience of coaching in different African countries, to use cricket as a way to build confidence and aspirations for girls in challenging areas of the UK. CWB hoped that through its delivery, it would provide a safe space for girls to be active in a non-judgemental environment, and foster the ability to discuss any concerns with a supportive network around to offer help where needed. In the 2015 Indices of UK Social Deprivation, where ‘one’ was ranked as the most deprived area, Manchester was fifth out of 326 local authorities. Working with schools in the area and Lancashire Cricket Foundation coaches CWB looked at what the key issues were (low social engagement and physical activity with girls) and developed a programme of easy bat and ball based games, which were accessible for all to participate in without prior sports experience. 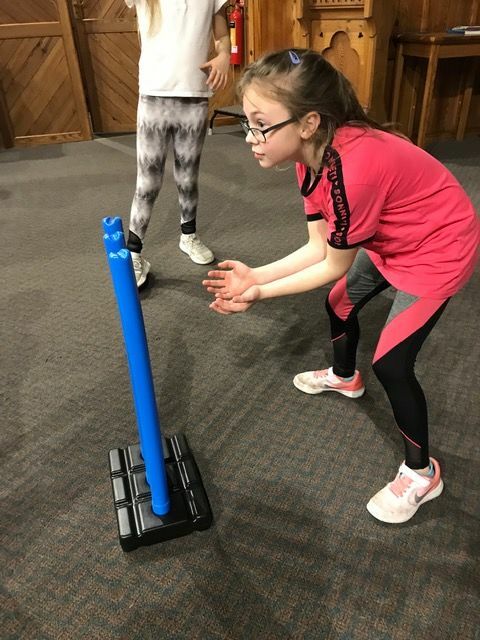 It was anticipated that this would encourage an inclusive environment, where girls could be active, learn a new skill eg throwing a ball, and facilitate teamwork. The inclusivity element was key. Fundamentally CWB was playing sports with girls who live on the margins of UK society - where many had low self confidence, unexplored aspirations and little opportunities. They came from a variety of different diasporas, adding to the complexity of the target group CWB was working with. There were also little opportunity for the girls to be able to afford to do things, let alone be active. As the programme started to be delivered in schools as a free extra curricular activity, the Lancashire coaches and schoolteachers’ fed back that through having the time to play together and work as a team, over time they started to see the girls’ attitudes and confidence grow; with their coach, with each other and most importantly in themselves. This began to facilitate, the sought-after ‘safe space’ where the girls had the growing confidence and now security to disclose some of their concerns. Using the example of throwing a ball, in this session the girls not only learn this skill through facilitated discussion, they had the opportunity to write what is worrying them on a white-board. This is placed at the base of the stumps, and the girls get the cathartic opportunity to throw a ball at the stumps and therefore their concerns. This not only releases some of their frustrations, it’s a signpost for people supporting the girls to know what is happening so they can provide assistance. Issues such as bullying, peer pressure, leaving school without qualifications, not getting a job, boys and racism were brought out during the sessions. For the teachers assisting with the delivery, it helped them to connect with the girls and understand what was influencing their behaviour in the classroom, so they could begin to address the issues affecting the girls. The LBW programme expanded this year to North-East England, where like Manchester there are high levels of social deprivation, but also rural isolation affecting many of the girls within the area. Partnering with the Durham Cricket Foundation, and the Girls Friendly Society (GFS), key to the delivery here was making sure that each of the different programmes catered for the specific needs of that community. Durham Cricket Foundation manager Josie Pointon explained: “The Let’s Be Women project is an innovative and groundbreaking programme that allows us to be creative in the way we support, educate and inspire young girls and women within our communities. “Through the programme we are able to generate a safe space for our group and provide an enjoyable and informal learning environment. This allows us to not only motivate and inspire our girls through cricket but to also develop a reciprocal communication channel to thoroughly understand the complex needs and issues that may arise within our young girls’ lives. “In turn we are able to tailor programmes and deliver vital support to facilitate social development. Not only that, but the physical activity sessions also have a huge impact on both the participants’ physical and mental wellbeing’. Another key aspect for delivery in the North-East was training females from the communities where the sessions would be run to deliver the LBW programme. 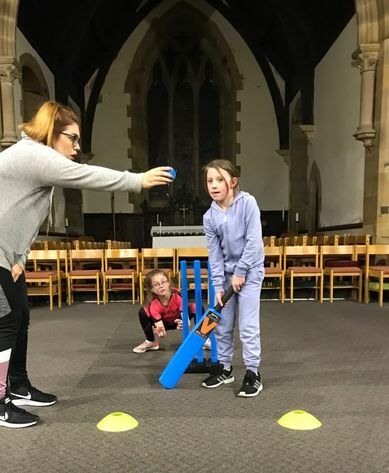 In Shildon, ranked as the most socially deprived area in the North-East in the last indices of social deprivation in 2015, the LBW sessions there are run in a church (with pews pushed to the side) as there is no community space in the area for children and young people to play. The lead facilitator of the LBW programme is Lucy Mann, who grew up in the area and understands the challenges that the girls in the community face. After the delivery of the initial six-week programme, GFS Regional Co-ordinator Helen Morrell stated: “The LBW programme has had a significant impact on our volunteers as well as the girls and young women attending GFS groups. Topics such as those identified in the Manchester project again emerged, but also the social media ‘lie-dentity’ in the context of building confidence and to not critically compare to others based on what people purport on social media. Lucy has since been part of a CWB project to Kenya promoting equality, opportunities for girls and HIV awareness, and the girls attending the Shildon project are eager for more opportunities to play cricket and make friends. Although geography divides areas where CWB gender equality programmes or work is delivered in, the themes that come out during the sessions – in Kenya or the UK – have a broadly similar basis, with some nuances depending on particular issues that are live within that community. What is key to not under emphasise is facilitating the opportunity for girls to be active and reaping the much-reported benefits of what playing sport can bring to their overall social development. Working in connection with key partners in these different communities, CWB’s Let’s Be Women programme facilitates this and the charity looks forward to continuing its delivery in other areas, whilst developing further in the areas it has worked in so far. If your organisation would like to respond to November’s call for articles on sport and employability, please contact hello@connectsport.co.uk.